ATLANTA – January 28, 2019. 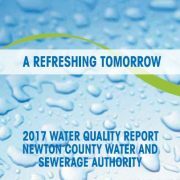 The Newton County Water & Sewerage Authority was awarded a $25,000,000 Clean Water State Revolving Fund (CWSRF) loan by the Georgia EnvironmentalFinance Authority (GEFA) board of directors. The loan will finance the construction of the Little River Water Reclamation Facility and access road, conversion of existing forcemain to gravity sewer, and the installationof sewer main. The project will provide infrastructure and treatment capacity to facilitate job creation and commercial development. The authority will pay 1.93 percent interest on the 30-year loan, which is eligible for a reduced interest rate because Newton County is a WaterFirst Community. The CWSRF, a federal loan program administered by GEFA, provides communities throughout Georgia with low-interest loans to fund wastewater infrastructure and water pollutioncontrol projects. The program is jointly funded by the U.S. Environmental Protection Agency and the state of Georgia. Eligible projects include a variety of stormwater and wastewater collection and treatment projects. These projects conserve and improve waterresources and facilitate economic growth and development. Low-interest loans from this program are available up to $25 million. 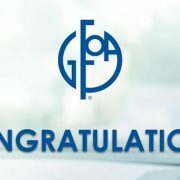 The following entities have won GFOA’s Distinguished Budget Presentation Award for the first time: West County Wastewater District, California; Newton County Water and Sewerage, Georgia; Ann Arbor Area Transportation Authority, Michigan; City of Horseshoe Bay, Texas; City of Donna, TX Government; and City of Staunton, Virginia. Have you ever had water that had a dis-satisfactory color, odor or taste? You would wonder if it was safe to drink, wouldn’t you? 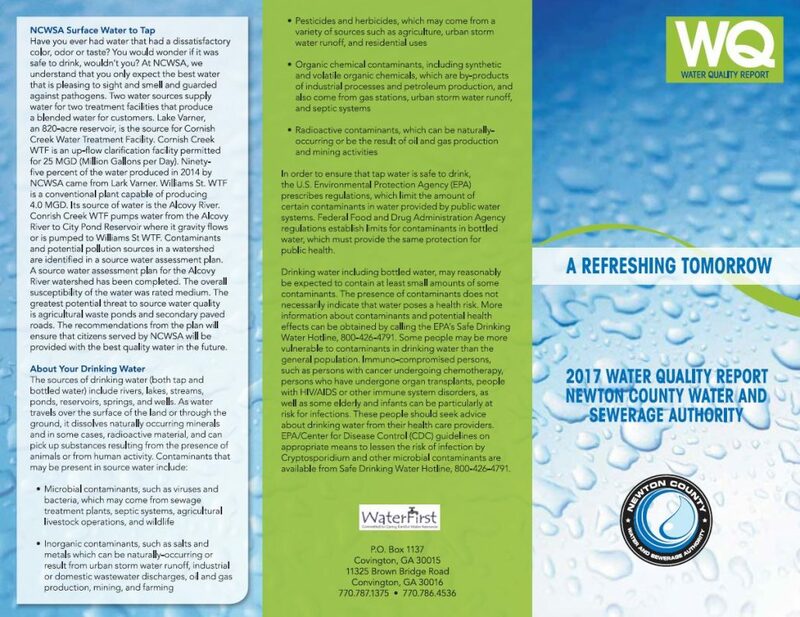 At NCWSA, we understand that you only expect the best water that is pleasing to sight and smell and guarded against pathogens. Two water sources supply water for two treatment facilities that produce a blended water for customers . Lake Varner, an 820-acre reservoir, is the source for Cornish Creek Water Treatment Facility. Cornish Creek WTF is an up-flow clarification facility permitted for 25 MGD (Million Gallons per Day). Ninety- five percent of the water produced in 2014 by NCWSA came from Lark Varner. Williams St. WTF is a conventional plant capable of producing 4.0 MGD. Its source of water is the Alcovy River. Cornish Creek WTF pumps water from the Alcovy River to City Pond Reservoir where it gravity flows or is pumped to Williams St WTF. Contaminants and potential pollution sources in a watershed are identified in a source water assessment plan . A source water assessment plan for the Alcovy River watershed has been completed. The overall susceptibility of the water was rated medium. The greatest potential threat to source water quality is agricultural waste ponds and secondary paved roads . The recommendations from the plan will ensure that citizens served by NCWSA will be provided with the best quality water in the future. 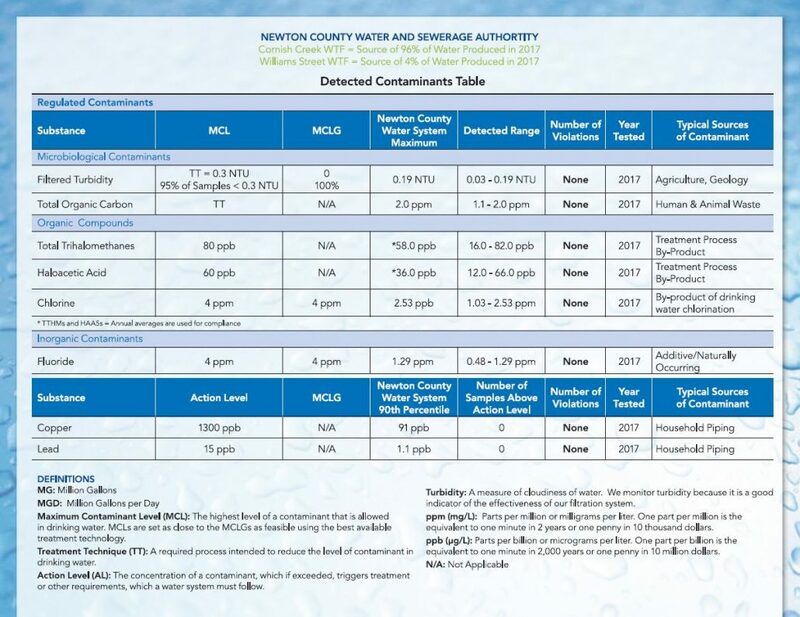 certain contaminants in water provided by public water systems. Federal Food and Drug Administration Agency regulations establish limits for contaminants in bottled water, which must provide the same protection for public healt h.
available from Safe Drinking Water Hotline, 800-426-4791. Under a Level 1 Drought Response, the outdoor water use schedule required under the Water Stewardship Act of 2010 remains in place. This schedule allows outdoor water use year-round between 4 p.m. and 10 a.m.